The Half Term period can be a tough one, entertaining the children over the course of two weeks can be exhausting, trust us we know. At Manchester Fort, we have a wide range of stores and events to keep your children happy, and to help give you a little rest whilst they’re occupied with a new game or toy. Want to treat the children to some new toys? A great way to keep them occupied and entertained and we have a wide range of stores with a fantastic selection of toys and games. Pick up some great toys, books and activities from The Works, or for children who are a little bit younger, Mothercare have a wonderful range of toys, don’t forget ASDA Living, Argos & TK Maxx all have a selection of toys and games to keep your little ones happy. Game have a wide range of the latest game and accessories for your consoles to keep the family entertained. 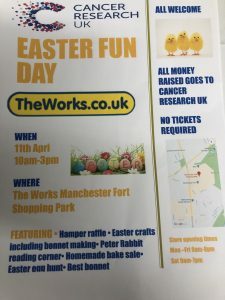 The Works are also hosting an Easter Fun Day on Thursday 11th April at 10am – 3pm. Featuring a range of amazing activities including- Hamper raffle, Easter crafts, Bonnet making, Peter Rabbit reading corner, Homemade bake sale, Easter egg hunt, Best Bonnet.